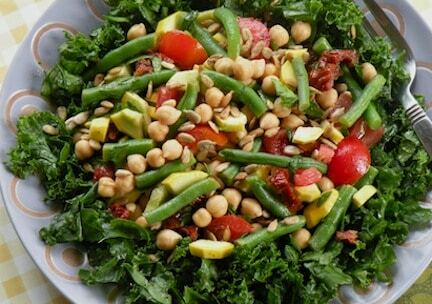 This appealing mix of yellow summer squash, green beans and chickpeas is especially welcome when slender fresh green beans are abundant. It makes a great summer salad that can be a main dish, served with crusty bread and fresh corn, or as a side dish for vegan quesadillas or grain dishes. Scrub the squashes, cut them in half lengthwise, and slice them 1/4 inch thick. Steam them until they just tender-crisp. At the same time, steam the green beans separately until just tender-crisp. Once done, rinse the vegetables immediately under cold water and allow to drain for a few minutes in a colander. Combine the squash and green beans in a large serving bowl along with all the remaining ingredients except the greens. Toss well, and if time allows, cover and refrigerate for several hours. Stir occasionally to distribute the dressing. 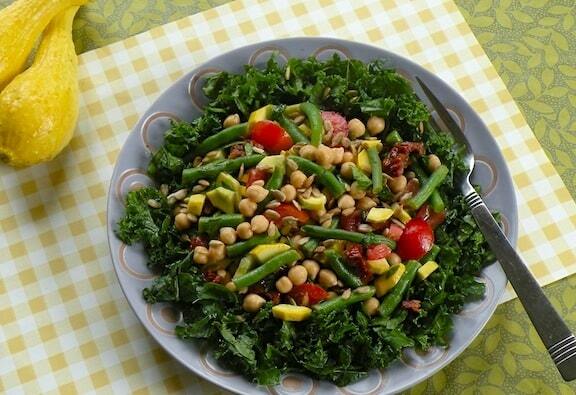 Just before serving, line a platter with greens and mound the salad over them. Sample more of VegKitchen’s recipes for zucchini and other summer squashes. Browse more of our main dish salads.